Telecommuting, virtual teams, outsourcing, and globalization have all contributed to increased incidence of virtual meetings between people who never meet face to face, or at least, haven't met face to face yet. For these meetings, a simple agenda isn't enough, because people need to know more about each other to work effectively together. To make the meeting more productive, distribute a program — not just an agenda. 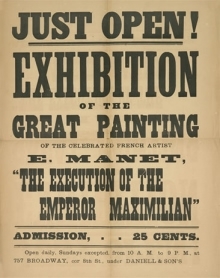 Handbill for the exhibition of Manet's "The Execution of Emperor Maximilian," (now in the Kunsthalle Mannheim) in New York in December 1879. At the time, the handbill (which we now are more likely to call a "leaflet") was a favored means of advertising. The publication now known as Playbill first appeared in 1884, invented in this form by Frank Vance Strauss, though handbills had been used to advertise plays since Shakespeare's time. Image courtesy The Museum of Modern Art, New York. Pattern your meeting program after the programs of sporting events, plays, the opera or ballet. Playbill is an example. Since the program is replacing the agenda, it must, at a minimum, serve the function of the agenda. But you can also include background enrichment material of all kinds. Here are some ideas for your programs. If the meeting includes discussions or reviews of exhibits — contracts, reports, diagrams, audios, videos, and so on — attendees have to review them beforehand. Include links to these items. Or for the convenience of attendees, combine all exhibits into a zip archive to make downloading easy. In telephone conferences, being able to recognize each other's voices is a big advantage. But since recognizing the voice of someone you've never met is difficult, have everyone make recordings introducing themselves. Video is great, but audio helps too. Give everyone an opportunity to see and listen to each other before the meeting. Bios of all attendees help them establish relationships before the meeting begins, especially if some haven't attended this particular meeting before. Let people write their own bios. Professional bios help everyone understand each other's area of expertise. But personal details help too, because they give everyone little insights about each other as people. If a team or team member made an outstanding contribution recently, or received recognition for any reason, play it up. Most of us like to see our names in lights. Include a little summary of past successes and what the future holds. This helps keep people fixed on the goal. It's an opportunity not to be missed. Familiarity with the sites where people work helps people "place" each other in a context. It gives them a setting in which to imagine the other people attending the meeting, which is especially important for telephone meetings. If you're holding the meeting as an off-site, provide history and information about local attractions. For more on agendas, see "An Agenda for Agendas," Point Lookout for May 25, 2005; and "First Aid for Painful Meetings," Point Lookout for October 24, 2001. Would you like to see your comments posted here? rbrenJEcjTUqSRlDOfAWnner@ChacIOwACcDBcHxYqGoOoCanyon.comSend me your comments by email, or by Web form. If your organization regularly conducts project retrospectives, you're among the very fortunate. Many organizations don't. But even among those that do, retrospectives are often underfunded, conducted by amateurs, or too short. Often, key people "couldn't make it." We can do better than this. What's stopping us? See also Personal, Team, and Organizational Effectiveness, Effective Meetings, Effective Communication at Work and Virtual and Global Teams for more related articles. I offer email and telephone coaching at both corporate and individual rates. Contact Rick for details at rbrenEFVRQmoqvDXPSyFuner@ChacvuJYgBMQVoCKnFOSoCanyon.com or (650) 787-6475, or toll-free in the continental US at (866) 378-5470.